LEIPZIG, Ukraine -- An Ukraine Air Alliance Antonov AN-12BP, freight flight from Leipzig (Germany) to Mineralny Vody (Russia) with 7 crew, was preparing for departure after being loaded with live chicken at Leipzig Airport, engines 1 and 4 were already running, when fire broke out. 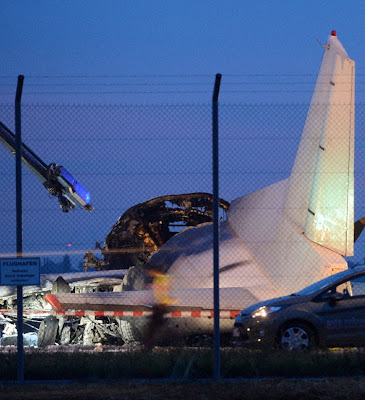 The crew was able to leave the aircraft in time before the aircraft burned down completely. The airport was closed for about one hour until fire services had extinguished the fire. Germany's BFU is investigating the accident. An investigation team is on site, further details are not yet known. According to ATDB Ukraine Air Alliance operate 6 Antonov AN-12BPs with the tail numbers: UR-CAG, UR-CAJ, UR-CAK, UR-CGV, UR-CGW and UR-DWF. According to photographic evidence all aircraft except UR-CAG, that has an entirely white vertical stabilizer, have the airline's logo on the vertical stabilizer, hence most likely UR-CAG is the accident aircraft. UR-CAG flew from Krasnodar (Russia) to Stockholm Arlanda (Sweden) as flight UKL-4097 on Aug 8th and flew on to Leipzig as flight UKL-751.